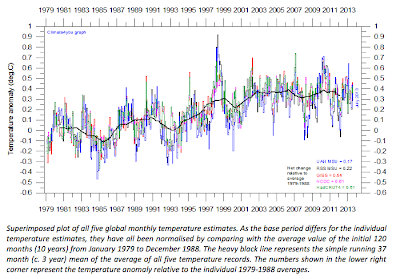 Still no warming.....Except between IPCC and NIPCC! 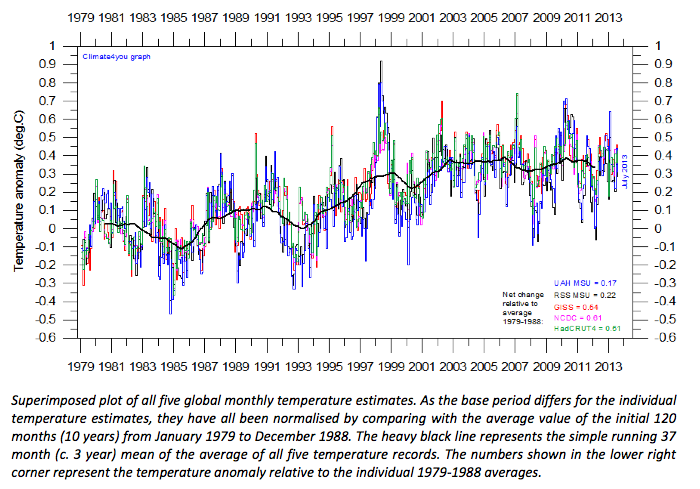 This includes the above graph which superimposes all five global monthly temperature estimates. 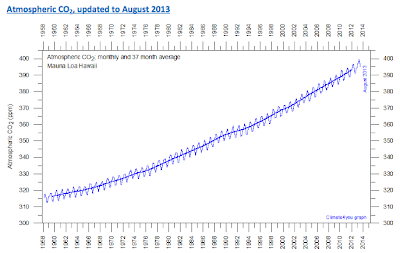 Meanwhile, what has been happening with the demon Carbon Dioxide? Meanwhile the atmosphere between realists and alarmists is definitely going to heat up. 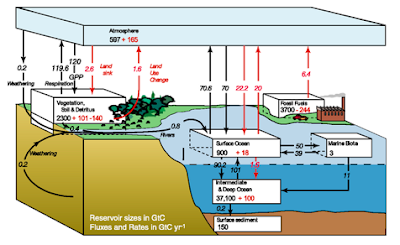 The IPCC has released preliminary leaks of its forthcoming Fifth Assessment report. Mind you, this leak was before the many governments have got to it and changed it. 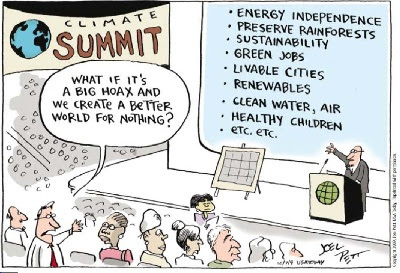 And change it they will until it is more alarmist. The IPCC will consider the Working Group I (WGI) contribution to AR5 covering the physical science basis of climate change in Stockholm, Sweden, 23-26 September 2013. This WGI session will approve the SPM and accept the full report. A brief IPCC Plenary Session will follow to accept the action taken by WGI. We read that between now and the "official release" Scientists working on the most authoritative study on climate change were urged to cover up the fact that the world’s temperature hasn’t risen for the last 15 years. It should be pointed out that the IPCC was set up with the sole purpose of blaming man-made carbon dioxide emissions. From "Taxing Air" by Bob Carter and others. Contrary to public perception, the IPCC does not examine the full array of influences that affect climate and climate change. Instead, the IPCC’s Charter directs the organisation to assess peer-reviewed research that is ‘relevant to the understanding of the risk of human-induced climate change’. Thus the primary functions of the IPCC are to assess the role of human-related carbon dioxide emissions in modifying global climate, the likely impact this might have on human society, and what responses society might take to mitigate those impacts. The Heartland Institute, on the other hand, has released Climate Change Reconsidered II: Physical Science which hits global warming alarmists with objective data and peer-reviewed studies the way Mike Tyson hit Michael Spinks with uppercut lefts and overhand rights. The new report, known as CCR-2, includes more than 1,000 pages documenting the evidence that anthropogenic carbon dioxide emissions are not causing a global warming crisis. The report contains literally thousands of citations to the peer-reviewed literature. Global warming alarmists often misrepresent the peer-reviewed literature, claiming virtually no peer-reviewed studies call the alarmist narrative into question. However, the alarmists can make such a claim only if they use a deceptive straw-man argument that their “narrative” is merely that global temperatures have warmed during the past century, such that the Earth is no longer in the depths of the extraordinary Little Ice Age. Well heck, everybody knows that. The issue is not "is climate change happening", for it always is and always has. Nor is it about whether carbon dioxide is a greenhouse gas or not, because all scientists agree that it is. Scientists who advise the United Nations (UN) Intergovernmental Panel on Climate Change (IPCC) worry that a doubling of carbon dioxide over pre-industrial levels will cause warming of between 3 and 6 deg. Celsius, whereas independent scientists calculate that the warming for a doubling will be much less - somewhere between about 0.3 and 1.2 deg. Celsius. 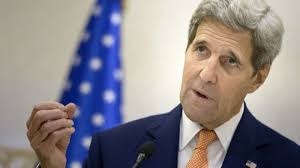 Bob then talks of the Non-governmental International Panel on Climate Change (NIPCC). In classic Green Team: Red Team tactical management style, the NIPCC has the role of providing an alternative Red Team view of the science of global warming, acting as a sort of "defense counsel" to verify and counter the arguments mounted for climate alarm by the IPCC's Green Team prosecution. That report was released this week. 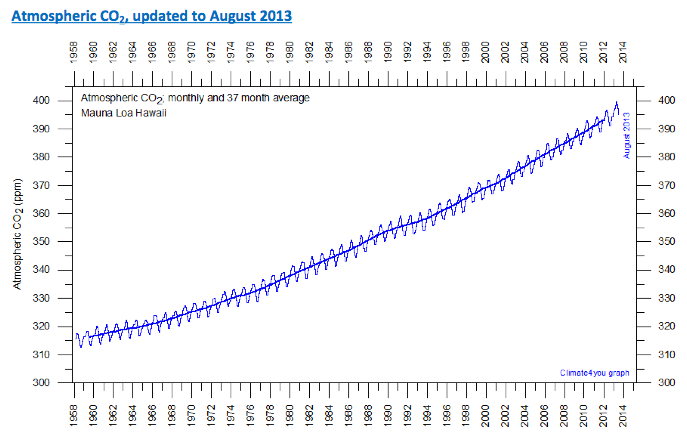 Can the Alarmists ever admit that science has shown them to be wrong, that the CAGW hypothesis has been falsified? Or do the grants get in their eyes, does the dosh change their minds?